A Tigerwood deck is one of those inviting places you invent reasons to escape to. Also known as Brazilian Koa and Goncalo Alves, Tigerwood is an exotic hardwood with exceptional character and benefits. When you see some of the Tigerwood deck pictures that our customers have sent us, it’s easy to see why this exotic hardwood is so special. You can buy genuine Tigerwood by browsing through the available sizes of Standard (E4E S4S), Pre-grooved, or Tongue & Groove profiles. Your order will be processed and shipped to your job site right away. It's simple to accomplish an amazing backyard makeover with Tigerwood Deck Tiles from TigerwoodDecking.com®! 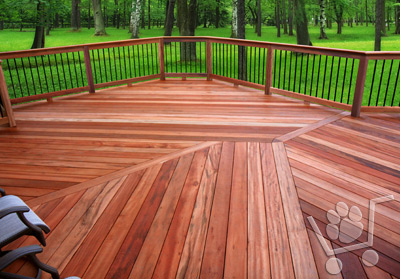 It's easy to buy Tigerwood Decking from our shopping cart. Just follow the simple directions in the video above.